Starting out as a fresh faced 14 year old, (but lets be honest he’s doesn’t look much older today) Green ‘Leprechaun’ George is a decade into his DJing jaunt and shows no sign of slowing down. 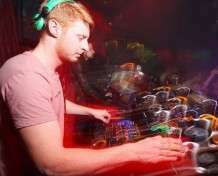 Studying mixing styles of Carl Cox to Tiesto, George also effortlessly moves from folk to classic rock depending on the vibe…which usually sits on deep, funky, soulful house. The last year has seen him include original productions and remixes into his sets, which take you on a journey through the years with re-edits of classics and rare unheard 12”s. If you have trouble understanding George don’t assume he’s had one too many, he’s just Irish…which is why we let his music do the talking.